Wellllllll, Hey! How are you guys today? I'm doing great because today (at the time I am writing this post) I got my cast off! It's very exciting to have my wrist and arm free again (if you didn't know, I tore two ligaments in my wrist training jiu jitsu and needed reconstructive surgery to repair it). Now I just have to wear a brace for the next month-at least I can take it off and give my hands a proper washing. I'm hoping that writing and coloring will be a little easier too because the cast did make that difficult. Anyways, enough about me... Welcome back to another amazing week of WWYS! This week's challenge is a beautiful set from Stampin' Up! called, Choose Happiness. After one discarded attempt... here's my card. I made the center background piece (starburst) first and then built the rest of the card around it. I used Pistachio Pudding to stamp the leaves on both backgrounds. On the starburst background I used Lost Lagoon and Daffodil Delight to sponge a background. Then I colored the leaves with Pool Party and outlined some of them with Daffodil Delight. 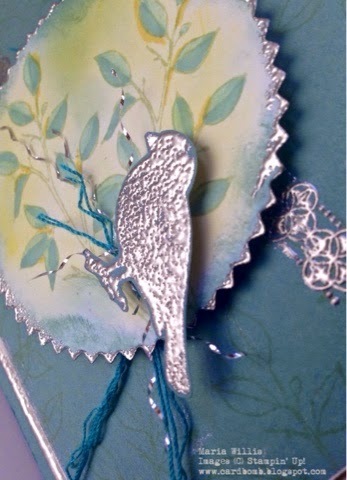 The bird, the border and the pretty background stamps are heat embossed in Pewter. I used scraps/shreds of the Bermuda Bay sequins string and the silver pulled out of the silver baker's twine to embellish the card. I about died when I was pulling the silver out of my twine. I felt like I was ruining it but I do love the way it looks on this card. I also really like that embossed stamp in the background. It's so elegant! Here's a little side view so that you can see some of the details a little better. Here's what the whole stamp set looks like. It's got a couple of great sentiments. I've been trying to make more blank cards lately so I didn't use either one of them on this card but my fingers are itching to use them soon! 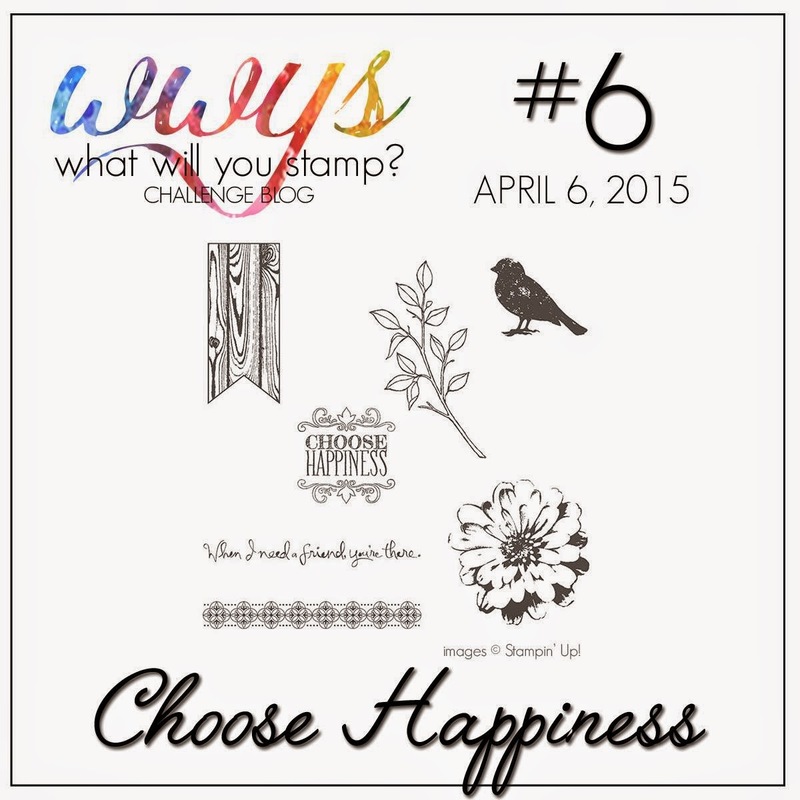 Don't forget to check out what the rest of the WWYS Design Team has created using Choose Happiness. As always, I'm looking forward to seeing... What Will You Stamp?! No minimum order required! What a great time to stock up on the retiring In Colors products and whatever else you've been holding out on from the current Main catalog! Here's a link to shop and please let me know if you have any questions! This is just beautiful Maria. 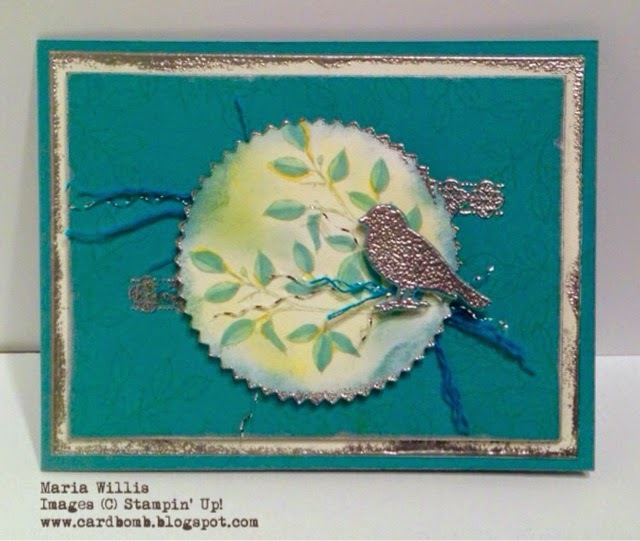 Love the effect of the circle and branches with the bird. You rocked it! So glad you are doing better. Don't overdo. Hugs! I'm so glad you have your cast off!! You'll be back in shape in no time :) I love this card -- the embossing is awesome!! !